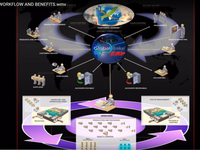 Globalbake ERP is configured so the system can grow with your business. We serve large multi-plant bakeries to small one to two man shops. Embedded POS solution for small and medium-sized enterprises which helps with comprehensive retail services, multiple programming, LAN and WAN networking, customizable file layout and more.